Last night, after being steamrollered all afternoon by my kids, I went out to have some fun. The community center had organized some do-it-yourself crafts tables followed by a performance. And it really was fun. I sat next to a generally “hi, how are you?” neighbor and actually had a 45-minute “tell me about your life” conversation. And simultaneously I sunk into a really pleasant focused-on-creating-something mode, and made this mosaic. I wasn’t thrilled with final product, but I felt it was fine, and anyway the main point of attending was to have some fun and heal from my horrible afternoon. And then it was time for the performance to start. And for the first time, I looked up from my mosaic at the mosaics of the women around me. One thing you might not know about Israeli women is that they are almost always WAY better at crafts than us Americans. And looking around I saw that every other mosaic on the crowded table was much better in every possible way than my mosaic. 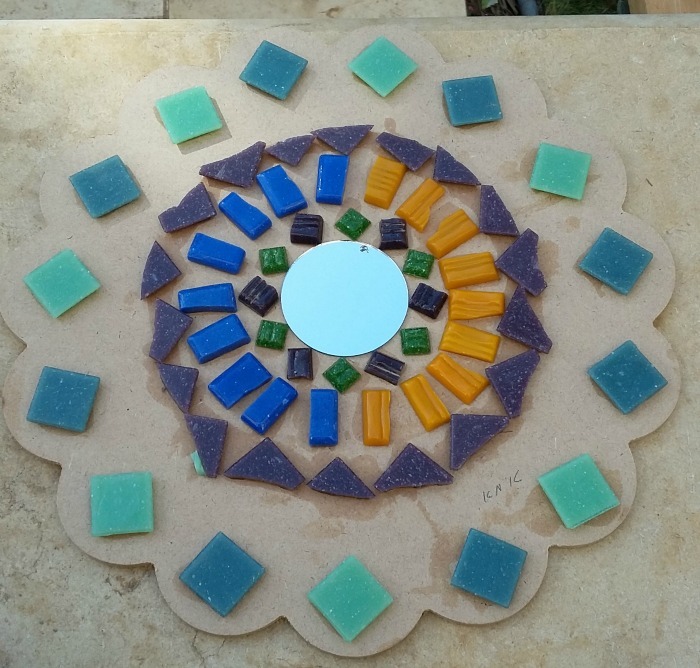 The mosaics of the other women were prettier, more creative, more colorful, and the stones were cut more cleanly and not put in upside-down, as the instructor informed me mine were. My mosaic was inferior. And looking around at the table, I realized that it wasn’t only my mosaic that was inferior. That mother over there has worked the night-shift every night this week, and taken care of her toddler all day, and she is still way more patient with her kids than I am and has a cleaner house than I do. That mother over there also has an active 1-year-old and 4-year-old boys like me, and she somehow doesn’t feel as steamrollered by them as I do every afternoon. And that mother…When her son was Shabbat Abba in gan, she made iced cookies shaped like lit candles. When Yaakov was Shabbat Abba I just bought some cheetos at the corner store. When I got home, 11-year-old Moriah was still up. Somewhat embarrassed, I showed her my inferior mosaic. I placed the mosaic down on the living-room table and took another look at it. Not perfect, but, well, good enough. Like the mother who made it. Just wondering how many of those other mothers have immensely inspiring and popular blogs with thousands of followers……. being a mosaic artist myself for a number of years, my first mosaics were pretty plain and uninspiring. later on, they developed into something wonderful on every level. I like to think of making mosaics, is like taking the broken and fragmented pieces of our lives and reframing and reinterpreting a new design, a rebirth, sort of like the life-affirming Phoenix rising up out of the ashes and thriving into new territory stronger than before. whether actual mosaics or whatever, as mothers, wives, and friends we spend so much of our lives raising the broken and shattered sparks and imbibing them with new life, new pulsating energy. keep working on your mosaics whatever medium you may choose on your creative journey. Reread your other article about “being a master of the human condition” which you are . You have this amazing inspiring talent and deep clarity into life situations, you inspire and share with us. That’s beautiful. YL hit the nail on the head. It is really inspiring though to get inspiration from you because you are both relateable to as you share insecurities and challenges but also give us such deep but practical insights. Thank you as always for sharing these moments in your life. They leave me feeling so much better about who I am and also strengthened! I agree 100% with Simcha. Keep it up Chana Jenny! Thanks for sharing your feelings. I think many of us struggle with feelings of inadequacy. As Miriam Adahan was always telling us, “Comparisons produce temper.” Hashem has chosen you for your unique skills and He obviously wants you to continue. Much hatzlocha! I love your daughters reaction! Your mosaic might not be as good as others (no pictures to compare yours with) but look what a wonderful daughter you have who loves you so much and is so good at giving compliments! CJ, you are NOT inferior because you don’t work the night shift or are sometimes less than patient with your kids! You are perfectly YOU. I wonder if your daughter’s expressive and enthusiastic words were actually copied from her mother’s model. If you built up your children’s self-confidence by oohing and aahing over their handiwork, it stands to reason that those children will see the beauty in other people’s efforts, including yours! Children are indeed the greatest work of art a parent creates.